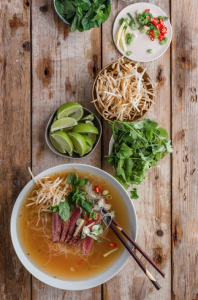 Delicious beef pho is my go-to bowl of nourishment and immediate restoration, be it a cold or a hangover; this Vietnamese staple is a constant at my table! Our quick recipe is so tasty – an instant hit of comfort and goodness. Empty your Sadie’s bone broth into a pot and add all your ingredients, apart from those reserved for garnish and bring to a gentle simmer. Blanch you noodles in boiling water for 5 minutes and remove and place in your broth. On a griddle pan sear your sirloin steak to your liking (medium-rare works well with this recipe as the hot broth will cook it further). Slice and place gently onto of your spiced broth. Pour into bowls and add your steak garnish with you beansprouts, chillies, lime and coriander and add as little or as much of your sriracha and hoisin as you like.